By continuing to read this post you are acknowledging that you are 19 years of age or older. Sooo if you haven’t already heard, October 17th is weed legalization day in Canada. If this isn’t your thing, look, I totally get it. But this is a part of our country now and I personally have no issue against this plant medicine. I think there are far worse things we need to spend our time and energy on than punishing people for consumption of this plant. So I am fully embracing this day and thought I would offer some guidance with how to use cannabis in an edible or topical way. 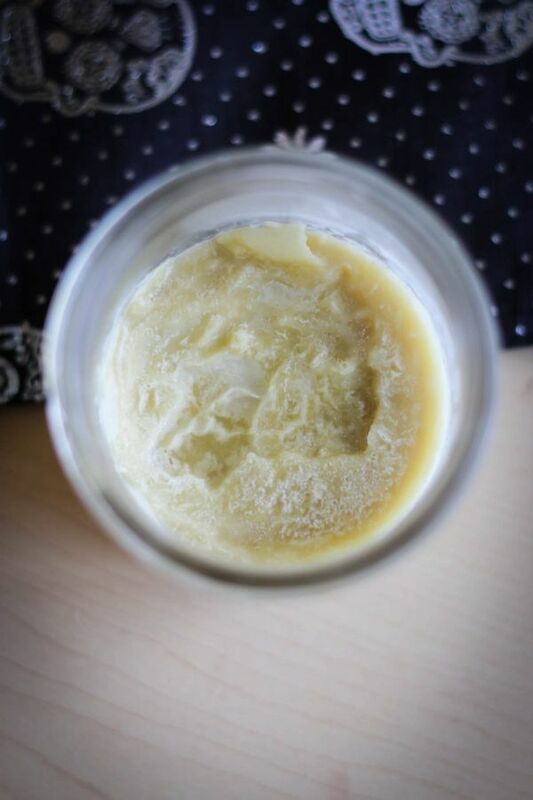 Today, we learn how to make cannabis infused coconut oil. I have found CBD oil and cannabis to be exceptionally helpful for anxiety (amongst the other coping tools I use). I have also found some relief for severe PMS cramps through topical or smokeable cannabis. There are countless other people who have found cannabis to be helpful for all kinds of things ranging from arthritis, chronic pain and inflammation to cancer, epilepsy, ADHD and M.S. just to name a few. Dosing is very important and please start small- oils are slow acting and long lasting. When ingesting, give plenty of time for the dose to ‘hit’ before you take more – at least 2 hours. Be overly cautious when making your own – it’s better to use too little than too much. Check how much THC is in the strain you are using – you may prefer a higher ratio of CBD:THC or vice-versa. 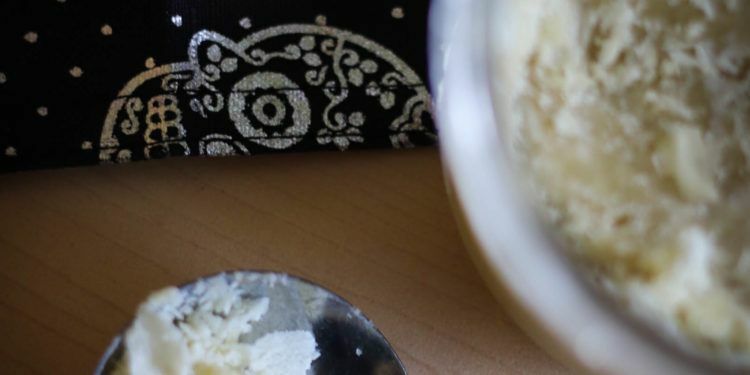 For this recipe, you need to use a fatty oil or butter in order for the cannabis to infuse into it. 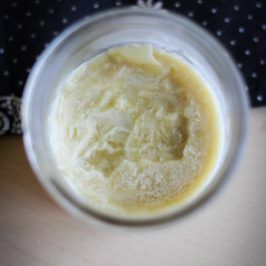 I like coconut oil because it is stable at higher temperatures, remains solid at room temperature and can be used for edibles or topical applications and of course, it’s plant-based! Now how can you use a cannabis infused coconut oil? Well, you can replace oil in recipes with it. Again – be mindful of the amount/dose. You can use it topically for pain relief by itself or by adding other healing ingredients such as beeswax or aloe to make a cream or salve. I’ll post a recipe for one, soon! 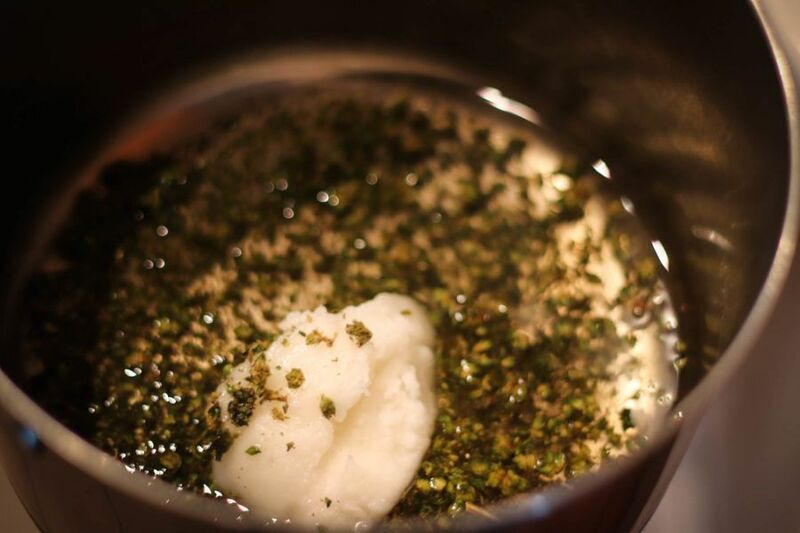 Before you make your infused oil, you need to decarboxylate the cannabis you’re using. Decarboxylation is basically a fancy science term for bake your weed! This is because we need to turn the non-intoxicating acidic cannabinoid called THCA into THC. Normally this is done through the process of smoking of the cannabis, but because we aren’t doing that, we will apply gentle heat and dry the weed out in a different way. The basic recipe needed for plant based edibles and topical applications. If ingesting, start with no more than 1/4 teaspoon. 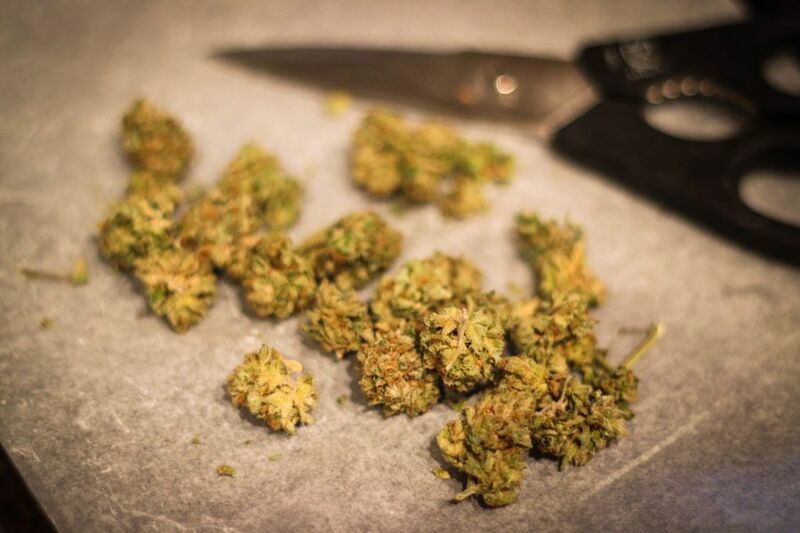 Preheat the oven to 220 degrees F.
If you have full buds, grind them down, and make sure there are no large pieces. Spread your weed out on a non-stick or parchment lined baking tray. Bake for 25 minutes, but give the tray a shake halfway through the baking process. If your bud is super fresh, it may take an extra 15-20 mins to dry out. Just keep checking on it. Combine the oil and cannabis in a saucepan over low heat (a double-boiler works great, too, and is easier to prevent scorching). You really don't want to heat the cannabis higher than 245F. And remember to stir often! When the oil has melted, give them a stir and let them simmer away on low for 3+ hours. Be sure to stir frequently to prevent burning. You can totally use a slow cooker for this, too, on low 4-6 hours! When time is up, place a sieve over a bowl and add a couple layers of cheesecloth. Pour the oil mixture over the cheesecloth to strain. Leave it for a while to cool down and strain really well. Use your hands to squeeze out the remaining bit. Store in an air-tight jar in the fridge. Use sparingly in your favourite recipes or natural body care applications. 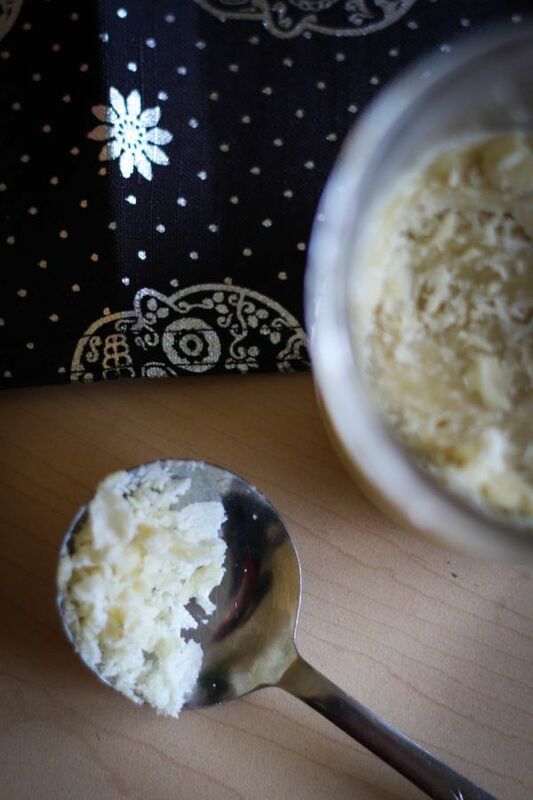 If ingesting, use no more than 1/4 teaspoon at first. The information contained on this site is for informational and entertainment purposes only. I am not a doctor or medical professional. Any health advice about using cannabis is my opinion, based on my general experience and knowledge- but not specific to you. Always seek the advice of your own healthcare professionals. By reading the information on this site, you agree that my company (Koko’s Food Media) and myself (Koko Brill) are not responsible for your health or the health of your dependents. You further acknowledge that you will not use the recipes or content to engage in illegal activities.